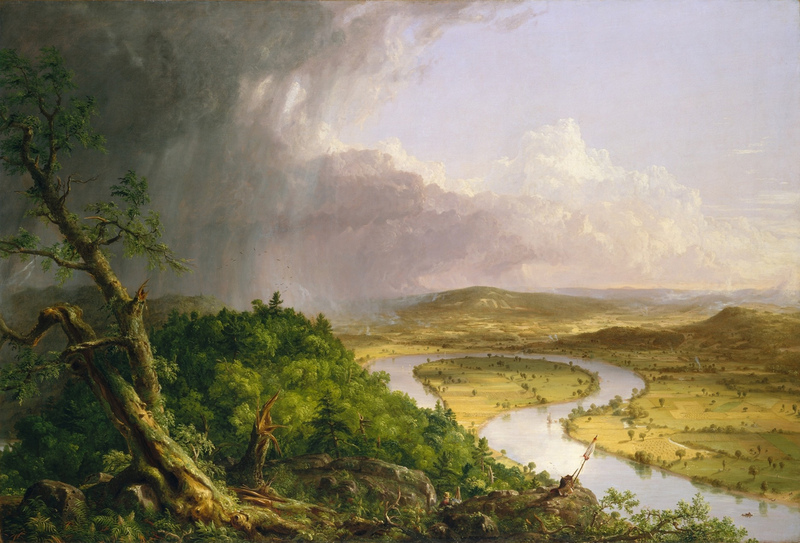 “View from Mount Holyoke, Northampton, Massachusetts, After a Thunderstorm (The Oxbow),” by Thomas Cole, 1836. Wilderness on the left contrasts with a rural valley on the right. The contrast has variously been interpreted as beautiful wilderness vs. dull civilization or as disarray and bad weather vs. sunlit peace. Image is public domain. The painting is owned by the Metropolitan Museum of New York. 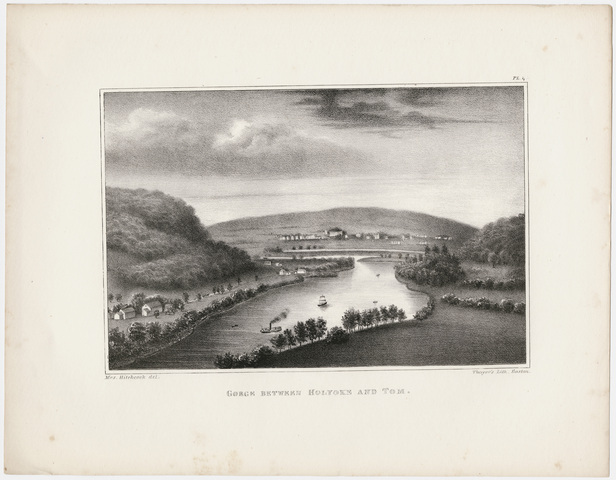 “Gorge between Holyoke and Tom” (meaning Mount Holyoke and Mount Tom) in the Connecticut River Valley of western Massachusetts, by Orra White Hitchcock. This landscape was one of several she did for her husband’s “Final Report on the Geology of Massachusetts,” published in 1841. 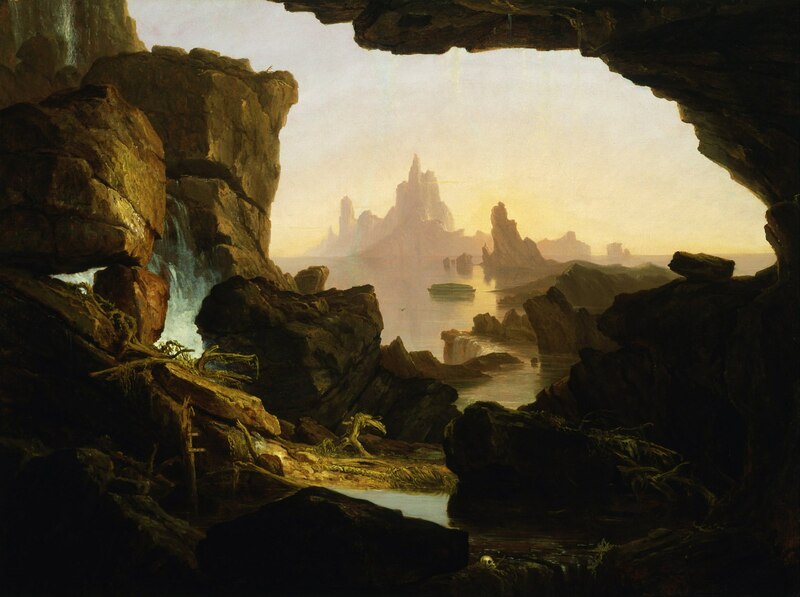 Thomas Cole painted a view from Mount Holyoke in 1836. Orra Hitchcock seems more at ease with the pleasantly settled valley than does Cole, with his juxtaposition of wilderness and rural civilization. Both articles quote William Blake’s evocative phrase “dark Satanic mills,” and both consider one of Cole’s more famous paintings, called “View from Mount Holyoke, Northampton, Massachusetts, After a Thunderstorm (The Oxbow).” Cole created the painting in 1835, which happens also to be the year in which Edward Hitchcock was writing his first paper on the fossil “bird tracks,” now known as dinosaur footprints, of the Connecticut River Valley. Hitchcock would soon discover that fossil tracks littered the whole valley, including the immediate surroundings of Mount Holyoke. The site of Cole’s painting is only a few miles from Amherst College, where Hitchcock was teaching geology and other sciences. Knowing the appreciation for landscape cherished by Edward and his wife, Orra, it is surprising to think that they may never have met this artist with whom they had so much in common. Hitchcock even has a personal association with the Oxbow, as he witnessed its formation in 1840 when flooding cut through the narrow neck of the river’s loopy meander, cutting it off from the main stream. Like other artists of the period, Cole was greatly interested in the new science of geology. It was more than a passing fancy. He assiduously studied geological texts, amassed his own rock collection, and closely observed the landscapes he painted to make sure he depicted them in a way that was geologically credible. His primary collector and patron, Daniel Wadsworth, was brother-in-law to the Yale scientist and publisher of the American Journal of Science, Benjamin Silliman, Hitchcock’s mentor and lifelong friend. Wadsworth founded the Wadsworth Atheneum in Hartford, Connecticut, which still exhibits a glorious collection of paintings from the Hudson River School, including several Coles. “The Subsiding Waters of the Deluge,” Thomas Cole, 1829. Note the erratic boulders on the far left and right, presumably carried their by the biblical Flood. The disordered mishmash of rocks and branches (and a human skull) in the foreground were also left by flooding waters and are being exposed as the calm waters recede. Currently at the Smithsonian American Art Museum. Public Domain. Listen to a reading of a perspective on a different painting, written by art historian Rebecca Bedell, author of The Anatomy of Nature: Geology and American Landscape Painting, 1825-1875. The work under discussion is “The Subsiding of the Waters of the Deluge,” painted by Cole in 1829. Like many of his contemporaries, Cole believed that evidence of the biblical Flood that carried Noah’s arkful of animals was still visible across the landscape in the form of erratic boulders, striations in bedrock, and broken sherds of rock. At the time of the painting, it would be eight years before Louis Agassiz proposed his theory that such characteristics were evidence that glaciers had once covered the northern hemisphere, gouging the bedrock as it spread outward and carrying the boulders and sherds, and dropping them later when it melted back. Hitchcock at first thought as Cole did, but he was to abandon the idea that detritus from the biblical Flood could still be seen scattered over the landscape. As a devoted Christian committed to Scripture, he believed in the Flood as an historical event, but thought that (1) it had been local to the Middle East, not a worldwide occurrence, and (2) whatever evidence had been left by the Flood was long since washed away by geological processes. Posted in Art, History, ScienceBookmark the permalink.